I promised to buy the new Coca-Cola can in Germany which is reclosable, but I have searched all over Düsseldorf and could not find any cans that was reclosable, only found that Coca-Cola have reshaped their cans to the longer can shape with 33ml like the Coca-Cola Plus I bought in Belgium. The longer slimmer shapes make it easier to hold than the wider shape. So people or children with small hands could hold it easier. It could be me but I just can't find any recloseable ones, or they are selling it somewhere else. 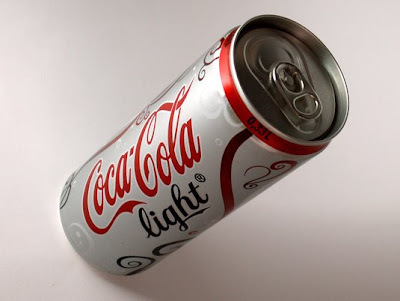 The new color design looks quite good compared to the previous Coca-Cola Light with less standard design between all the cans. The swirls are quite good and the logo is showed on one side with the other side for the informations. The silver here is actually the aluminum and not silver painted like the Coca-Cola plus. Only thing is might be just that I bought one with a miss production because if you look at the top the opening is on the wrong side. Because when you hold the can and want to show the logo on the other side from where you hold it. You can't drink it correct because it is on the other side.